Hello and welcome to the next 87Studios income report. For the first three weeks of November I had zero free time and as the result I published only 5 articles (including last report). Of course few articles have had impact on the profit. Anyway, as long as the income covers expenditures it's not a problem. What is also very important, I joined Rise Forums and am amazed how easy and close were answers for a lot of questions. You should check the review I made few days ago and join other bloggers. I also read this month a bunch of useful articles, you should check at least those two The Secret To Finding Proven Money Making Niches written by Lewis Ogden from CloudIncome.com and Why Recurring Commissions Are Not Always As Good As They Appear by Kevin Muldoon. Ok, that's all important stuff worth being mentioned, let's play with numbers now. Still 150 visits on average day - that's totally fine, but hope it's gonna change. 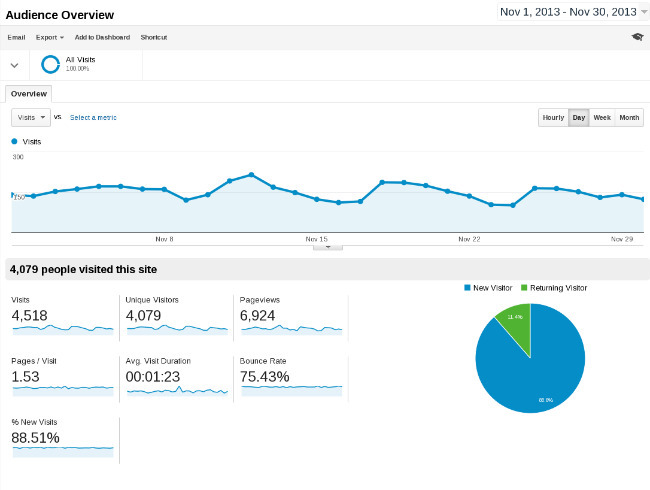 Check out the charts from Google Analytics. I decided to remove income details. As I told last month, changing server location (that's only my guess) brought traffic back. Or maybe it was the little SEO work done last month? I'm really not sure which one of those two did that, but it's good that something helped. At the end I'd like to say THANK YOU to Kevin from Rise Forums for support. I like what I am seeing! I have a good feeling that you're going to rock it in 2014 - you're on my watch-list for sure. You got a really good work ethic and display persistence. Just keep it up on this quality level and you're bound to success. Keep it steady man ! You are doing great ! What commenting platform are you using btw? It's awesome ! In a matter of income from RiseForums affiliate program I got nothing (yet) - but in a matter of knowledge - it's priceless. I know no other place where you can talk and brainstorm ideas with so many top bloggers and marketers. You are doing a lovely job with your site. Hope you can make more the next time round. I think December won't be the top month 😉 We'll see in a couple of days. Good report Kris. Income looks pretty steady every month. Are you trying to maintain a specific posting frequency every month? Yeah, income looks steady, I'm very happy that I got few quick jobs and few next are in queue. And I promised myself to reinvest income in January and hire a writer. Best of luck. I need to bring a writer in soon too. It will free up a lot of my time to work on different things. At the very least, it will help me increase my posting frequency and get more good articles out there.